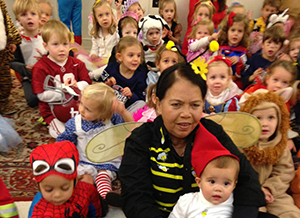 At All Saints Preschool, we have a strong bond to All Saints Church. The Childrens’ pastors and School join together in a weekly chapel where the kids hear Bible stories and lessons, sing songs, and learn that God loves them! Throughout the year, ASP hosts several fun events to bring parents, children, teachers, and staff together.